Butterscotch Matcha lends its creamy velvety taste to many baked products and also different ice creams. Its sweetness is also excellent for many candies and other snacks. It is the perfect choice for those with a compelling sweet tooth who want to make it a worthwhile experience. This makes it an instant favorite with the young who love all things sweet and tasty. For special occasions, Butterscotch Matcha lends its sweet appeal to any palate looking for the ultimate sweetness elixir. It makes the perfect mood enhancer when a person is looking for something sweet to replace chocolate. Butterscotch Matcha stands in a class of its own when offered within a variety of sweet tasting snacks. This is because; its vanilla appeal is universal and very recognizable in any palate of any age. Because of its well-loved sweetness, it is easily chosen to grace many special occasions where an assortment of different tasting snacks is required to suit different audiences. If you love butterscotch hard candies then this is the matcha for you! Its my new secret sinful delight! This is EXACTLY like those butterscotch hard candies from childhood! 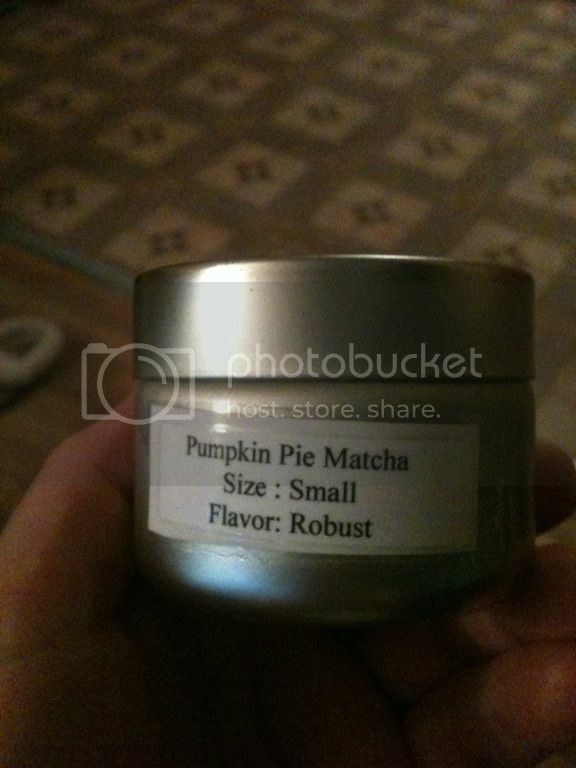 I think if I had to pick one matcha that I would never share with others this would have to be the one. Although there are so many I have yet to try I think so far this is my favorite. I just made myself laugh though because I have said that with almost every new matcha from Red Leaf Tea I have tried. Seriously though, this is so very yummy, and sweet, and just really the one that I feel will always hit the spot for me! What is even more cool is that when I mix it in my latte concoction – which is how I usually have my matcha, the butterscotch flavor comes out even more and is not by any means hidden underneath the milk or vanilla creamer! I always do try matcha straight before mixing it in my latte and I will say that the butterscotch flavor is stronger in the latte mixture than straight which I found interesting and odd at the same time. You will pay an extra 4.00 for the tin which I recommend unless you have tins of your own at home. Far easier to scoop the powder from a tin than the bag and the bag is not resealable. I almost always go with a robust flavor, not always but most all of the time especially with dessert flavors! Sometimes with berry or citrus flavors I go with distinctive. I have yet to find a distinctive flavor however that is not excellent! I think it is because I when I want a dessert flavor I want it all out dessert like and with the lighter fruity like matcha I don’t mind a little more of the base matcha to come through. Still, even with the robust flavoring I am absolutely getting the flavor of the base matcha here! Red Leaf Teas matcha powder base is excellent! I don’t know how Red Leaf does it but their flavors are all natural and while I certainly appreciate the health benefits to matcha I am finding I reach for it more and more simply for the flavor but I can’t deny the excellent energy boost! Its like an energy drink without all the sugar which means you don’t come down and fall on your face later in the day! This is a different kind of energy boost, one that makes you more alert and on the ball and it does not end abruptly finding yourself feeling lower than before you had the drink as energy drinks do. This trails off nicely and in a mellow fashion allowing you to ease into the afternoon or evening! I am now drinking at least one matcha per day, after my morning black tea! Everytime I read your reviews I get more and more excited to try matcha. I bought some caramel matcha yesterday so excited. random side note… don’t suppose you have a picture handy of the tins from red leaf handy? no but I can take one I suppose lol Im so lazy not feeling the best today. let me get one. I’m also curious as to what the tins look like! The label is crooked – now I have to fix that lol – I cut the label out from the package it came in and taped it to the tin. the lids screw on by the way – very secure! ohh I LOVE that! I can definitely imagine spraying green powder everywhere if it was just a pop top haha! Yeah I am so clumsy with my tea! I love the screw top! lol yeah…there would go half the matcha POP! Thank you so much for the picture! It’s a nicely-done Butterscotch flavor without being too overdone. It’s creamy and buttery and pretty sweet! I hope to spend more time with this one – soon – but first impression – it’s a goodie! Oh lord now I want to go make some you all know how much I LOVE this one! Okay, I admit that I would probably have never looked at this flavor twice had it not been for Azzrian’s rave reviews! The more I read about it, the more I wanted it. Here is where to get it! Mine is robust flavor level. I needed a good energy boost today because I have been about as useful as a knot on a log. I have felt tired, sluggish, and sleepy and I know it is because I have been cooking and eating all the wrong foods since Thanksgiving. But I can not let this house go any longer without doing some big time cleaning! Matcha to the rescue! It really was a comedy of errors getting it all put together, which makes a great testament to how hard it is to mess this up! I got out a container and measure the milk, it is metal so I can’t heat the milk in the microwave. I got a container to heat the milk, it was too small to mix the milk. I put the warm milk in a larger container and mix, almost forgetting to add the Turbinado sugar I had especially picked for this matcha latte. But hallelujah! It is delicious in spite of my blundering! And the very best part is that I got a ton of cleaning done that I have had my eye on for about a week now. Mix 1/2 teaspoon matcha with a teaspoon of water for a thick paste. Heat one cup milk in microwave, adding about 1 1/2 teaspoons sugar either before or after heating. Add hot milk to matcha paste and mix with immersion blender. VOILA! Delicious latte and clean house! Oh my god Azzrian you are a doll for sending me this matcha. SO GOOD!! At first I made it too strong and all I could taste was this chemical bitterness but then I diluted it and all was well. Well kindof. I guess because my first exposure to Matcha was through a latte, I’m accustomed to it having a thicker feel. and I have a feeling Starbucks adds extra “flavouring” so that it shows through the milk, because when I make a latte at home, it just isn’t the same punch of flavour. but, I am slowly getting used to the thinner consistency and flavour. In fact, in the butterscotch here, I quite like it that way. Its like a candy but liquid and oh SO VERY TASTY. Werthers? yes please! This was yesterday. Made using the shaken bottle method. Oh and a dash or two of milk didn’t seem to make much difference. Definitely need to experiment some more. I am glad that you are enjoying it! It is SO good in a latte with milk and sweet cream creamer!! omg that sounds like heaven!! I usually go for distinctive for dessert-type flavors, but I wasn’t so sure about how butterscotch-y I wanted my matcha to be haha. Plus, I had spent way too much by the time I added this one to my cart! I find that there’s not really a TON of difference in flavor levels: at least, the matcha is always going to taste like the correct flavor. Yeah, robust gives it a little more oomph, but it also masks the matcha a tiny bit so distinctive and delicate are the way I usually go. I made an iced latte of this for the bf (and English Toffee for myself!) and WOW. I took a little sip (hey, I have to be able to review it!) and promptly gave the mug to him. I expected I’d have to finish it off: he likes matcha, but never actually finishes a whole mug haha. Tiny mugs even! But this one, oh man, he downed 2/3rds in one chug. The rest vanished minutes later! Successful? Oh yeah! This is his favorite of mine, and I think he’s tried almost all of them. So I said the boysenberry was my last but I’m leaving tonight for a while for a little vacation and there is no internet, so I wanted to get this up before I leave. So this is the last of my order :( Oh very very sad. But what can you do. I got this one because Azzrian ravs about it and its one of her favorites so I wanted to see what all the buzz was about. Now when I think of butterscotch first thing that comes to mind is going to my grandparents house when I was a kid, and always on the living room table was a bowl of butterscotch candy’s. And every time id go over my grandpa would sneak some for me since my parents didn’t like me having candy. Yay now off to the country for a couple days. It will be nice to be away from all technology, get caught up on my reading. See you all in about a week, have a great week guys! I had pretty high hopes for this one. Sadly, they fell short. It’s not that i didn’t like it..but it wasn’t butterscotch-y enough for me. I wanted butterscotch lifesaver flavour and instead this was a dialed back muted sort of butterscotch. I expect slightly more flavouring from “distinctive.” i suggest anyone picking this up that really wants a flavour punch – go for robust. Thank you Azzrian for sending me some of this Matcha to try. It is YUM! I had mine as a latte … I found that the creaminess of the latte was a nice match for the sweet, luscious butterscotch flavor. This was a “robust” flavored, classic grade of matcha, and I think that if I were to order it again, I’d go with the robust flavoring as well, because there was a really nice balance between flavor of Matcha and butterscotch flavoring. A really delicious Matcha – thanks again Azzrian! Butterscotch is another one of those flavors that I adore. Butterscotch anything is pretty much a guarantee I buy it. I love the rich buttery-ness of it. In my drinking days, butterscotch schnapps was my go-to drink. I love it. Mix it with a bit of milk or hot cocoa…oh yes. The best, though, is around the holidays, mix a touch of it into egg nog. Ooooh, now that’s an idea, egg nog matcha. Red Leaf Tea, I will love you forever if you develop an egg nog matcha by the holidays! I can’t have real nog any more, so I’ve been hunting for a good tea substitute. Anyway, yes. Butterscotch is love for me. It’s another Dad memory, he loves it and it makes me think of him…or maybe I’m just homesick this week. Butterscotch pudding is the only pudding I’ll touch and if an ice cream shop offers butterscotch topping, I’ll risk the dairy allergy to get a cone covered in the stuff. Liquid gold, it is. And seeing the success of Red leaf Tea’s Caramel and French Vanilla flavors, I have complete confidence in this blend being amazing. I think this definitely calls for a hot tea latte, despite it being stupidly hot outside. Am I in Toronto or back in Tennessee? These hot days are killing me…I should be able to handle them better! Thank you so much, Azzrian, for your generous samples! I’ve never had a matcha until now, so I’m super excited to try this! Since just about the only thing I knew regarding preparing matcha was that it needed to be put through a strainer to make it less clumpy, I went off to Google to look it up. Some site mentioned that preparing it in a travel mug and then shaking it could be used in place of a matcha whisk and bowl (both of which I lack at the moment), so I’m opting for that method instead of whisking the tea in a bowl with a fork or egg beater (I’m feeling a bit lazy at the moment). Now that the whisking part was taken care of, I tried to find out what the equivalent of a matcha scoop was in teaspoons. I wasn’t able to find clear answers, so I’m just going to use the smallest spoon I can find and then eyeball it with matcha amount and water. How I’m going to eyeball something I’ve never done before, I’m not too certain, but my mother is fantastic at doing it when cooking, so I’m hoping that I picked up that trait from her somehow! Well, I’ve just had my first sip of matcha! It tastes AMAZING. The powder did smell quite like butterscotch when I was putting it through the strainer, but I was expecting for it to taste a bit less like butterscotch when it was finally prepared. It’s basically like a less sweet version of butterscotch, which is great, because I love butterscotch candies but dislike how sweet they are. I think I can taste a bit of the matcha base, but I’m not sure. I also don’t know if that’s supposed to happen or not, but I’ll make a mental note to put in more water or less powder the next time I make matcha (hopefully tomorrow morning!). For now, I’ll try adding some milk to see how it tastes. Oh, wow, the milk brings out more of the butterscotch! Yum! This will definitely make my (many many) homework readings for tonight much more enjoyable. If many of Red Leaf Tea’s matchas are this great, I’m really looking forward to making a purchase from them when I’m able to! Thanks again, Azzrian, for sending me this sample!